It’s fairly unassuming today and may even catch your eye for the formerly commercial addition. Image: Google Maps, May 2016. It’s sometimes a happy story, and sometimes a sad one, but buildings always have stories to tell. 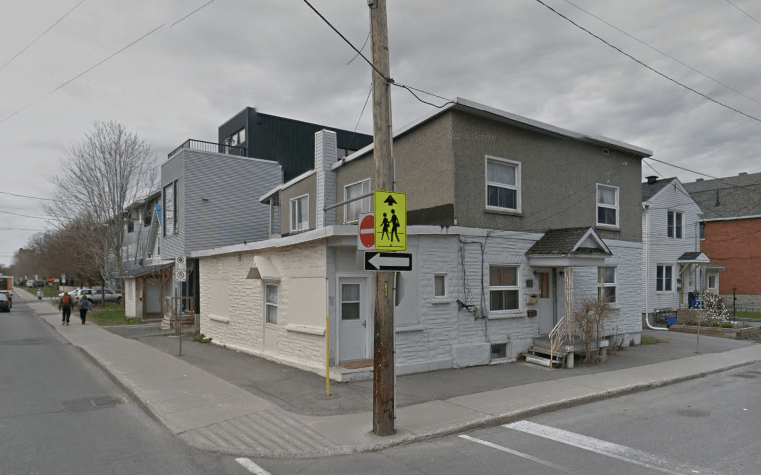 In the case of 82 Sherbrooke in Ottawa’s Hintonburg, it’s the latter. Three died in a fire that broke out around midnight. Source: Ottawa Citizen, October 15, 1953, 1. The fire began in the Murray’s apartment at about 12:45am. As is so often the case in these stories, the cause was identified to be faulty wiring. At 82 Sherbrooke, it began in the baseboard of the Murrays ground-floor living room at the rear of the building. Harold Murray, his wife Margaret, and a neighbour, Katherine Griffin, who had re-entered her upstairs unit to rescue her daughter, died in the fire. The Murrays lived on the ground floor of the building sharing a wall with the commercial annex and the Griffins were in the unit immediately above. When the fire broke out, the Murrays were unable to exit through the apartment’s main door, which was in the living room. A second door, directly off of their bedroom to the hallway, was both nailed shut and blocked off by a heavy cedar chest, leaving the couple to be quickly overcome with smoke. Katherine Griffin faced a similar fate when she re-entered her apartment to rescue her daughter Maureen not knowing that she had jumped out of her window at the back of the building.1”West End Fire Kills Three,” Ottawa Journal, October 15, 1953, 1,3; “Three Perish, One Injured In Gladstone Ave. Midnight Fire,” Ottawa Citizen, October 15, 1953, 1. 1. 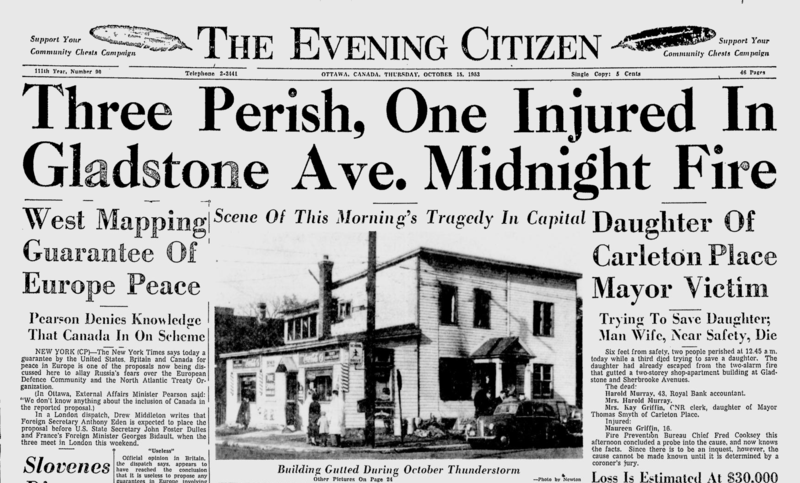 ↥ ”West End Fire Kills Three,” Ottawa Journal, October 15, 1953, 1,3; “Three Perish, One Injured In Gladstone Ave. Midnight Fire,” Ottawa Citizen, October 15, 1953, 1.